Clinically affected patients present with achalasia, alacrimia and ACTH-resistant adrenal failure along with progressive neurological impairment with or without mild mental retardation. Esophageal achalasia is a functional disease of unclear etiology. Achalasia patients typically present with progressive dysphagia (both for solids and liquids), regurgitation of undigested foods and chest pain4. Oesophagogastroduodenoscopy showed retention of liquid in the oesophagus, so oesophageal manometry was quickly carried out, and the results were strongly consistent with achalasia in the patient. Benign esophageal stenosis caused by Schatzki rings (B rings) or by peptic strictures is the most common cause of food impaction, followed by esophageal webs, extrinsic compression, surgical anastomosis, esophagitis (eg, eosinophilic esophagitis), and motor disorders, such as achalasia. Holtmann, "Esophageal perforation, inflammatory mediastinitis and pseudoaneurysm of the thoracic aorta as potential complications of botulinum toxin injection for achalasia," Digestive Endoscopy, vol. 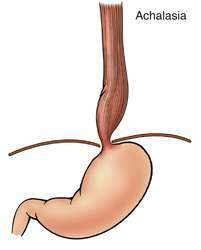 sup] Esophageal achalasia is a comparatively rare disease which usually presents with esophageal motility dysfunction characterized by failure of esophageal peristalsis and lack of relaxation of the lower esophageal sphincter. 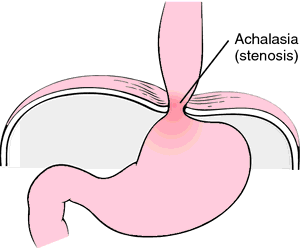 Achalasia is a condition in which there is loss of peristalsis of the smooth muscle of the esophagus, and failure of relaxation of the lower esophageal sphincter (LES). Achalasia is a rare oesophageal motility disorder, typically presenting with symptoms of dysphagia, regurgitation of food and retrosternal chest pain made worse on eating.